If you’re heading to Dodger Stadium for the Ducks/Kings game on Saturday, Jan. 25, you can take the Stadium Express. The game is slated to start at 6:30 p.m. and shuttles will begin service 90 minutes before game time. 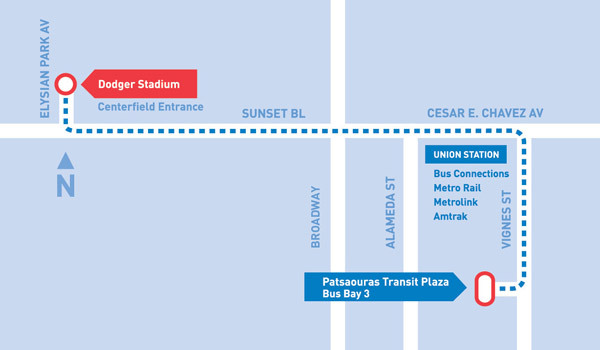 Board the Stadium Express at Bus Bay 3 of the Patsaouras Transit Plaza at Union Station. Service leaves Union Station every 10-15 minutes, starting 90 minutes before game time through the middle of the second period. Your game ticket is good on game day as Stadium Express fare only; otherwise, regular Metro fares apply. You’ll be dropped off inside Dodger Stadium behind Center Field. Service will run the same route in reverse after the game. Return service runs until 45 minutes after the end of the game. Connect at Union Station via Metro Bus, Rail, Amtrak or Metrolink. Parking is also available at Union Station for $6/day. Keep reading after the jump for details on Metrolink and Amtrak service. Finally, a reminder for Metro-riding Kings fans: you can save 10 percent on official Kings merchandise with your TAP card! Use the promo code METRO10 if buying online, or hop on the Blue/Expo Line to get to the Team LA Store at L.A. LIVE.